This PDF 1.4 document has been generated by / 3-Heights(TM) PDF Optimization Shell 4.5.24.1 (http://www.pdf-tools.com), and has been sent on pdf-archive.com on 08/10/2015 at 11:57, from IP address 109.149.x.x. The current document download page has been viewed 191 times. Fashion and Beauty excellence in St. Albans and District. 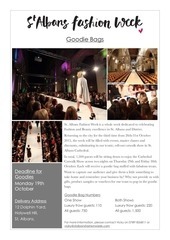 discounts, culminating in our iconic, sell-out catwalk show in St.
October. Each will receive a goodie bag stuffed with fabulous treats. This file has been shared by a user of PDF Archive. Document ID: 00306634.